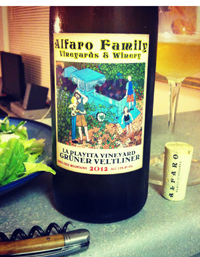 2012 Alfaro Family Vineyards, Gruner Veltliner “La Playita Vineyard” Santa Cruz Mountains. Only 70 cases were crafted from the 2012 vintage of this rare Gruner Veltliner, a grape more commonly found in Austria’s Wachau region near the Danube, west of Vienna, and the first release of this wine from Alfaro’s estate. The La Playita block of Gruner are young vines, but this premiere release shows massive potential and the 2012 is a fun and exciting white that delivers racy acidity, complex flavors and should sell out very quickly. The green/yellow hue is rather intense for such a vibrant white, but gives a inviting sunny appearance and leads to a zesty palate of lime, peach pit, bitter almond oil and verbena which begs for oysters no question, this white sizzles and is briskly crisp like a fine Muscadet. As a huge fan of Austrian wine, I was thrilled to try this wine and harbored some big expectations, and I’m happy to report this little white lived up and even surprised me with it’s compelling nature. The GruVe (Groovy) opens with air and gains a mineral chalky element and a tangerine note while still very bright and tangy. I’m sure as these vines gain age there will be more complexity and refinement in the future, but I really dig the energy in this release and will have to get a few more while there are still some left, serve plenty chilled and like I mentioned it should partner Oysters or be a great summer sipper on hot longs days.